ExxonMobil made the decision to begin drilling for oil in Guyana at the Liza field since this prospect was the biggest and best, based on data analysed by the company. By the time the oil major acquired rights to explore the 6.6 million-acre Stabroek block 120 miles offshore Guyana, 22 wells, from as far back as the 1970s, had already been drilled by other companies on the coastal shelf outside the southern boundaries of the block. All were non-commercial. He said all seven of these have to work for a successful discovery. “Generally, you drill the biggest, best prospects first when you enter a new area, which is what we did with Liza-1,” the Operations Manager stated. The “world class discovery” of 800 million to 1.4 billion barrels of light crude at Liza 1 in 2015 triggered a frenzy of activities. As the company’s technical experts in the Exploration, Development and Upstream Research companies continued to analyze the well data from Liza-1 and plan for potential future appraisal drilling, the largest 3-D seismic survey in the company’s history got underway on the Stabroek block. “The success of Liza-1 helped us to reduce the uncertainty of some of the elements for the broader area. It also helped us reduce the uncertainty for the elements of reservoir, trap, migration and seal in the area close to Liza-1,” Mc Gehee pointed out. Two seismic vessels acquiring data embarked on the 3-D seismic survey, covering an area over approximately 6,500 square miles, comparable to the land mass of the Hawaiian Islands. “The further you go away from these known areas, the riskier the prospects become. Skipjack, which was a bit of a step out to the north, did not work out. Turbot, on the other hand, which was a step out to the south east did work out. 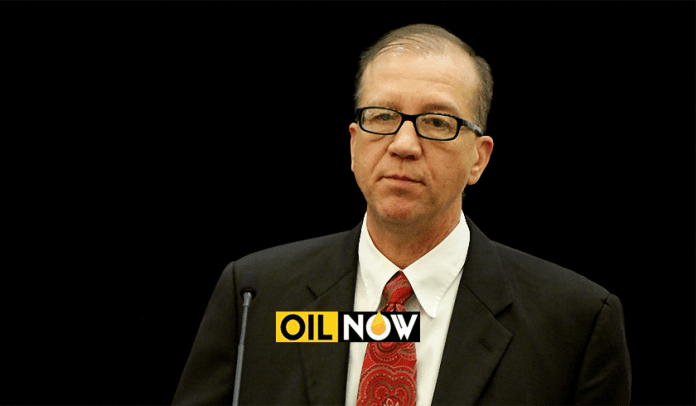 All of our sophisticated data helps, but, bottom line you analyze the data, ascertain the uncertainty and decide if it is worth the cost and time of drilling a well,” the Operations Manager told OilNOW. While the Skipjack drill campaign in 2016 came up dry, the company went on to make its 5th discovery in Guyana at Turbot-1 in October this year. The gross recoverable resources for the Stabroek block stood at 2.25 billion to 2.75 billion oil-equivalent barrels before the Turbot discovery. This estimate includes Liza, Liza Deep, Payara and Snoek. From all indications, Turbo could push recoverable resources in the Stabroek block to around the 3 billion oil-equivalent-barrel mark, as was pointed out by Guyana’s Minister of Natural Resources, Raphael Trotman, at a recent forum. A second well will be drilled in 2018 to determine the magnitude of the Turbot discovery.